ENR Southwest recognized Hub on Campus in the publication’s annual roundup of the outstanding regional projects completed in the past year. 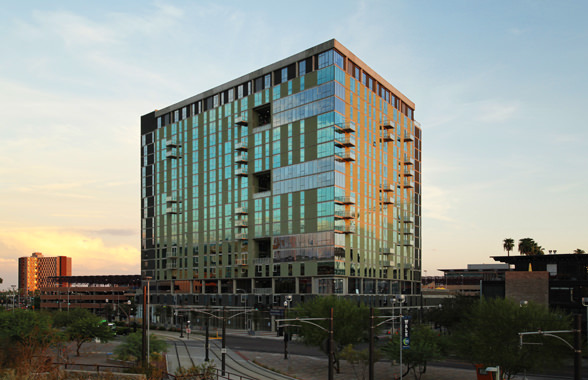 Named Best Project in the Multi-Family Residential/Hospitality category, the 18-story student residence is located on the Tempe campus of Arizona State University. The building houses 266 units with 615 beds, parking for 181 vehicles and 22,000 SF of ground-level retail and restaurant space. The contemporary architectural form of two rectangular volumes is clad in a façade of varying patterns of opaque and transparent glass. Targeting LEED Silver certification, the building incorporates a high-performance building envelope and ample daylighting through floor-to-ceiling windows and landscaped two-story sky terraces. “As a high rise, Hub on Campus is really a dramatic project, and when added with the fact that it is built to LEED standards, it really stands apart,” remarked one judge. The 2013 Best Projects were featured in the November 12, 2013 issue of ENR Southwest.